Are These Little Rockets the Future of Spaceflight? Fusion-powered rockets the size of only a few refrigerators could one day help propel spacecraft at high speeds to nearby planets or even other stars, a NASA-funded spaceflight company says. Rockets fly by hurling materials known as propellants away from them. Conventional rockets that rely on chemical reactions are not very efficient when it comes to how much thrust they generate, given the amount of propellant they carry, which has led rocket scientists to explore a variety of alternatives over the years. An option now used in spacecraft is the ion drive, which generates thrust by using electricity to accelerate electrically charged ion propellants. Ion drives are far more efficient than chemical rockets but are limited by the amount of electricity they can harvest via solar panels or generate using radioactive materials. Instead of chemical rockets or ion drives, scientists have also suggested using fusion rockets propelled by the same nuclear reactions that power stars. These rockets would not only be efficient but also generate vast amounts of electricity. Are You Watching These Upcoming Space Missions? We Are. The aim for the fusion drives is to get about 1 kilowatt of power per 2.2 lbs. (1 kilogram) of mass. A 10-megawatt fusion rocket would, therefore, weigh about 11 tons (10 metric tons). Related: Will This 'Impossible' Motor Take People to Other Planets? 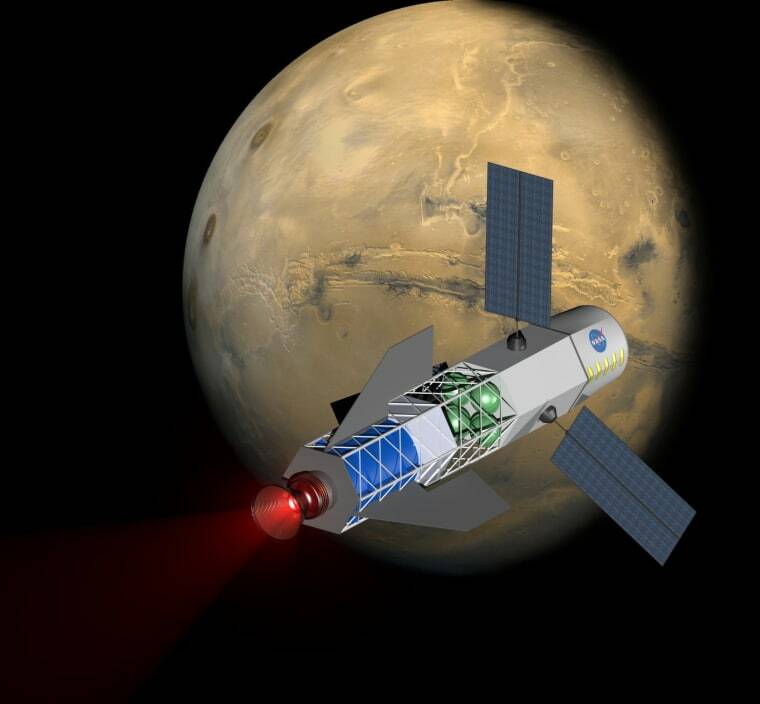 The large amounts of thrust this fusion rocket may deliver compared to its mass could enable very fast spacecraft. For instance, whereas round-trip crewed missions to Mars are estimated to take more than two years using current technology, the researchers estimated that six 5-megawatt fusion rockets could accomplish such missions in 310 days. This extra speed would reduce the risks of radiation that astronauts might experience from the sun or deep space, as well as dramatically cut the amount of food, water, and other supplies they would need to bring with them. Follow Charles Q. Choi on Twitter @cqchoi. Follow us @Spacedotcom, Facebook, and Google+. Original articleSpace.com. Science writer Charles Q. Choi is a contributor to Space.com. His work also appears in such publications as Scientific American, The New York Times and National Geographic.